Dawson will emerge as a beacon school for Challenge Success where student voice is the fabric of the culture. Our goal is for the community to adopt a cohesive climate of care where the definition of success, engagement and life satisfaction is authentic to the individual experience. 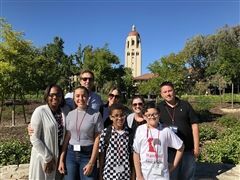 Read Stanford University’s latest White Paper about how high school students need to value fit over selectivity and challenge the traditional definitions of what a successful college search process and its outcomes look like. The “Do You Know” resource page offers facts from relevant research in the fields of health, education, and psychology. Challenge Success reviews data on topics such as sleep, cheating, mental health, media, play, and more. Visit the website for a few sample facts and download the corresponding PDF file to read all the facts along with source citations. Read about the examples of changes that Challenge Success schools have implemented. Challenge Success was founded in 2007 by Madeline Levine, Ph.D and Denise Pope, Ph.D. Leaders in the arena of education and adolescent development, Drs. Levine and Pope have researched and written extensively about education and adolescent development. Click here for a list of books written by the founders, board members, Stanford colleagues and conference speakers. At Challenge Success, we provide schools and families with the information and strategies they need to create a more balanced and academically fulfilling life for their kids. We work with teams of educators, parents, and students at schools to identify problems and implement best practices and policies in areas such as curriculum, assessment, homework, school schedule, and a healthy school climate. We provide support to parents by giving them the tools to help their children regain their balance, strengthen their sense of self, increase their motivation and critical thinking skills, and learn how to deal effectively with the inevitable challenges of life. And we conduct, collect, and synthesize research, so that the public can make informed decisions that will enable all children to thrive. What Does Challenge Success Value?